Graeter’s first Cleveland location will offer ice cream, sundaes, milkshakes and old-fashioned sodas, all with a star-D kosher rating. Graeter’s, which opened in Cincinnati in 1870, plans to open an ice cream parlor in Crocker Park in Westlake next summer. “Our first Cleveland scoop shop will allow us to share our love for authentic ice cream with the community while staying true to our vision of quality and integrity,” Richard Graeter, fourth-generation owner of Graeter’s Ice Cream, said in a news release. The 2,000-square-foot store will look like an old-fashioned ice cream parlor, accommodating up to 50, according to the release. Among the details to be worked out is deciding whether all items in the store, not just the ice cream, will be kosher. It is seeking certification from Star-K, a Baltimore-based kosher certification company. “The Star-K was just a little bit more known symbol and carries a lot more weight and appeals to those folks looking for the Star-K symbol,” Graeter said. Avrom Pollak, president of Star-K Kosher Certification, said when his company gets an application for a kosher certificate, information about the company is gathered. “We like to use the term, ‘GRAK,’ which means generally recognized as kosher,” Pollak said. One thing Pollak and his team look at is whether the product seeking kosher certification shares any factory equipment with non-kosher products. For dairy products, Pollak said the differentiation between cholov stam and cholov yisroel is taken under consideration when a product receives a kosher rating. “Star-D is a special designation for dairy items which are not cholov yisroel,” Pollak said. In the past, farmers would dilute cow milk with milk from a non-kosher species, Pollak said. He added that an observer would watch the milking to make sure this didn’t happen, classifying the milk as cholov yisroel. Without a person designated to watch the milking, products are not considered cholov yisroel. Graeter said some of the Graeter’s storefronts are kosher-certified, which requires everything in the store to be kosher including candy. 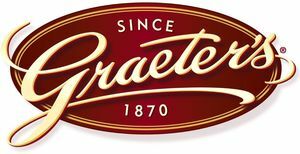 Graeter suggested that if it’s determined that the Westlake location be totally kosher, the source of the bakery items it carries will have to be totally kosher, too. Rabbi Stephen Grundfast of Beth El Congregation in Akron said he accepts the Star-D kosher rating from Star-K and looks forward to the shop opening. The nearest Graeter’s is in Columbus. The ice cream also is available at Giant Eagle, Heinen’s, Dave’s, Zagara’s Marketplace, Whole Foods, Mustard Seed, Miles Farmers Market, The Fresh Market and Acme in Northeast Ohio. He said since Graeter’s has the kosher rating, it has kosher supervision over the ice cream. Julia Fair is a sophomore in the E.W. Scripps School of Journalism at Ohio University in Athens.